President Trump wasted no time dumping Attorney General Jeff Sessions, just one day after the midterm elections. 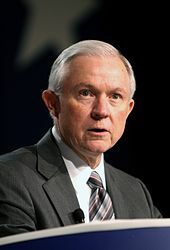 Sessions, a former Alabama senator, was routinely criticized by Trump for recusing himself from the Russia investigation, a decision that allowed his deputy to hire special counsel Robert Mueller to probe connections between the Kremlin and Trump’s campaign. Here is his resignation letter, dated Wednesday. Since the day I was honored to be sworn in as Attorney General of the United States , I came to work at the Department of Justice every day determined to do my duty and serve my country. I have done so to the best of my ability, working to support the fundamental legal processes that are the foundation of justice. The team we assembled embraced your directive to be a law and order department of Justice. We prosecuted the largest number of violent offenders and firearms’ defendants in our country’s history. We took on transnational gangs that are bringing violence and death across our borders and protected national security. We did our part to restore immigration enforcement. We targeted the opioid epidemic by prosecuting doctors, pharmacists, and anyone else who contributes to this crisis with ne w law enforcement tools and determination. And we have seen results. After two years of rising violent crime and homicides prior to this administration, those trends have reversed—thanks to the hard work of our prosecutors and law enforcement around the country. I am particularly grateful to the fabulous men and women in aw enforcement all over this country with whom I have served. I have had no greater honor than to work alongside them. As I have said many times, they have my thanks and I will always have their backs. Most importantly, in my time as Attorney General we have restored and upheld the rule of law—a glorious tradition that each of us has a responsibility to safeguard. We have operated with integrity and lawfully and aggressively advanced the policy agenda of this administration. Posted: 11/8/18 at 9:33 AM under News Story.